Equine photographers are equine professionals that are tasked with capturing high-quality images of horses in various settings. To perform their work, they must have an excellent knowledge of camera equipment including lenses, flashes, timers, and other related gadgets. They must also be able to utilize their equipment efficiently to compensate for changing conditions (or an uncooperative equine subject). It is common for modern equine photographers to use high-resolution digital cameras for their work. Equine photographers are often very involved with posing horses for certain photos, especially for conformation photos where proper balance is critical. It can be particularly challenging when working with foals, yearlings, or any individual horses that are prone to being temperamental. The farm will usually provide a few assistants to help pose the horse, so the photographer must be comfortable with directing others to get the needed results. It is important for all personnel to use caution when working in close quarters to avoid being bitten or kicked. Knowledge of equine behavior is a big plus for those hoping to work in this field. Once the photography session ends, the photographer utilizes photo editing computer programs to resize and enhance the images. They may also use a variety of special effects to improve the overall appearance of the photos. Equine photographers can work in many locations including horse shows, racetracks, breeding farms, riding stables, and at major equine events. They can specialize in working with a specific breed or a specific discipline of riding. Some specialize by focusing on a specific niche area such as offering stallion photography or conformation shots. Some equine photographers broaden their options by choosing to also take photos of other animals (often pets or wildlife). Others may add to their portfolio by taking photos of children, houses, or landscapes. 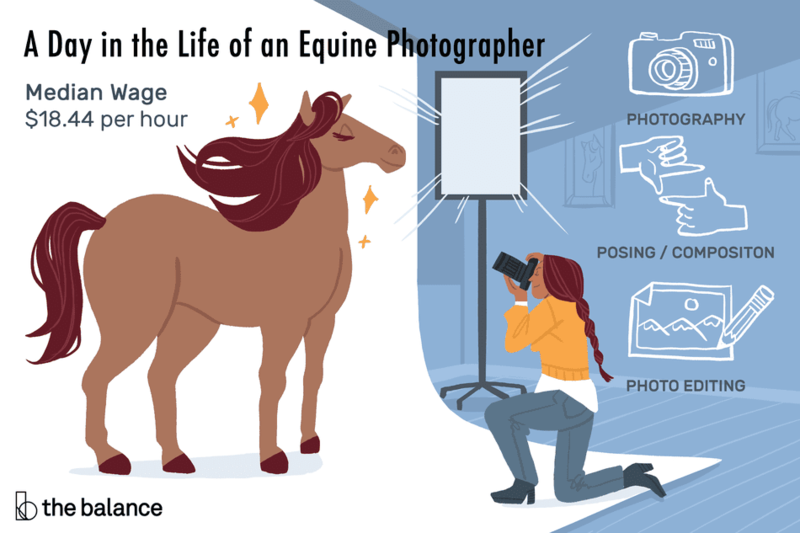 Equine photographers can pursue this career path on a full or part-time basis. They often work as freelancers, selling their photos to horse owners, magazines, or commercial advertising agencies. No formal training is required to become an equine photographer, but some formal coursework in photography is recommended (whether at the college level or through participation in workshops and seminars). A new photographer can also benefit greatly from interning with an experienced professional, acting as their assistant. It helps them to pick up insider tricks and make connections with professionals in the local area. Equine photographers often create an online portfolio or website so the public can see examples of their work and order photos. They may also benefit from uploading images to a portfolio on a professional equine photography website, such as the one offered by Equine Photographers Network, or by joining professional photography associations. The Bureau of Labor Statistics (BLS) does not separate equine photographer salary data out from the more general category of all photographers, but in the 2014 report, the mean annual wage for all photographers was $38,350 per year ($18.44 per hour). The bottom ten percent of photographers earned less than $18,120 ($8.71 per hour), while the top ten percent of photographers earned in excess of $68,930 ($33.14 per hour). Salaried positions in this field of work are rare, with most equine photographers working as freelancers to supply images to horse owners, commercial advertisers, website developers, and a book or magazine publishers. Some equine photographers choose to offer their images for sale through stock photo agencies. Under this arrangement, the stock agency licenses their clients to use images for a fee (a percentage of which is paid to the original photographer). Total income for this career path will vary depending on the specific niche in which a photographer chooses to specialize, how frequently they shoot, the quality of their images, their willingness to travel, and their reputation in the business. The equine photography industry is growing as horse owners demonstrate an increasing willingness to spend money on equine goods and services. Equine photography will continue to be an excellent full or part-time career option for freelance photographers with interest in the equine industry.